Hervé Niquet blends his forces in an uplifting and intense performance which brings out the expressive and rhetorical essence of music which is at once grand and intimate. Few people can live up to towering expectations, but when Johannes Brahms finished his German Requiem in 1868, he knew he had risen to the challenge his musical father Robert Schumann had set when he hailed 20 year old Brahms as a composer “destined to give ideal expression to our times”, and urged him “to direct his magic wand where the massed forces of chorus and orchestra would lend him their power”. The outcome of this request was a masterpiece which deviates from the traditional Requiem horrors of judgement and hell to address all mankind with a message of hope and comfort. In keeping with this message, acclaimed conductor Hervé Niquet probes under the accumulated patina of heavy-handedness and doom, to zoom in on the Requiem’s inexpressible kindness. Hervé Niquet, chief conductor of the Flemish Radio Choir as of 2011, has been made Chevalier of the Ordre national du Mérite and an Officer of the Ordre des Arts et des Lettres. 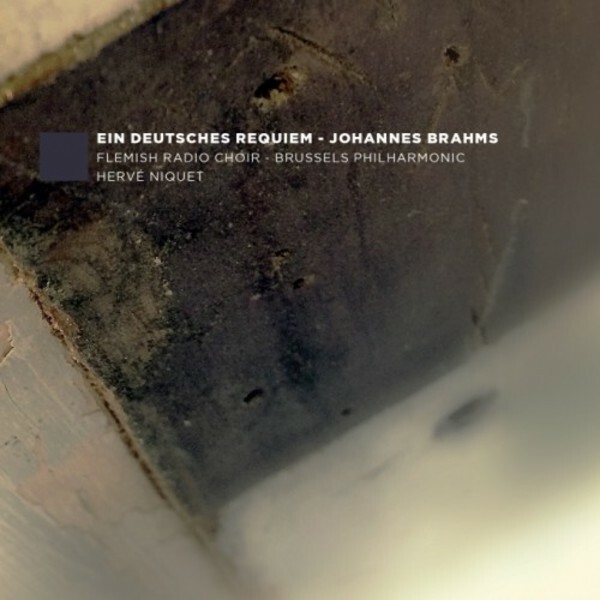 The German Requiem is the second instalment in a series of five CDs dedicated to iconic composers (Brahms, Mozart) but also to unjustly neglected Requiems (like the one by Maurice Duruflé). The first release in the series was devoted to Gabriel Fauré’s Requiem, and it was hailed in Classica as “un magnifique enregistrement”, in Gramophone as “life-affirming” because of the “fresh and vigorous singing of the Flemish Radio Choir” and the “crisp and neat playing from the Brussels Philharmonic Soloists”.